The first artist's illustration shows a close-up view of a supermassive black hole in a galaxy's center. Gas becomes hotter as it approaches the black hole, turning from red to yellow to white. Most of the gas is swallowed by the black hole, but some is launched in jets away from the black hole at almost the speed of light. The next illustration shows a larger area where gas is first attracted to the black hole, a region about a million times larger than the black hole's event horizon. The final illustration shows enormous cavities -- a hundred times larger -- that have been created in the galaxy's hot gas by jets from the black hole. Results from NASA's Chandra X-ray Observatory, combined with new theoretical calculations, provide one of the best pieces of evidence yet that many supermassive black holes are spinning extremely rapidly. 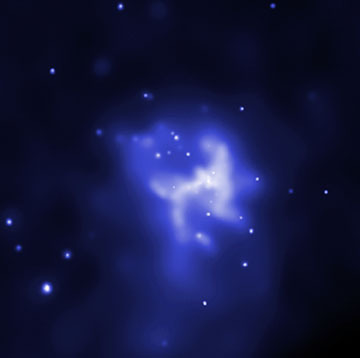 The images above show 4 out of the 9 large galaxies included in the Chandra study, each containing a supermassive black hole in its center. These images show pairs of huge bubbles, or cavities, in the hot gaseous atmospheres of the galaxies, created in each case by jets produced by a central supermassive black hole. Studying these cavities allows the power output of the jets to be calculated. This sets constraints on the spin of the black holes when combined with theoretical models. Coordinates (J2000) RA 12h 25m 03.60s | Dec +12° 53´ 14.10"
Coordinates (J2000) RA 12h 35m 39.80s | Dec +12° 33´ 23.00"
Coordinates (J2000) RA 12h 29m 46.90s | Dec +08° 00´ 13.00"
Coordinates (J2000) RA 15h 06m 29.40s | Dec +01° 36´ 25.00"